We've had such a lovely couple of weeks because at last, the sun is out and it's time for evenings in the garden, dungarees and ice creams. Speaking of which, Noah had his first '99' in the park on Sunday, which he absolutely loved and demolished as you can see, but he was very kind and shared with daddy, (I had my own haha). 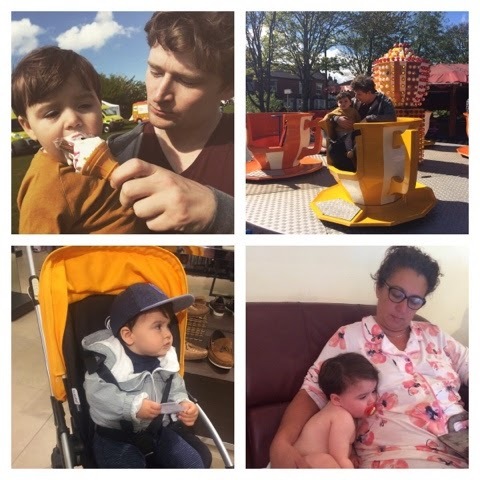 Sunday must have been the day for firsts as he also had his first go on a ride at the fairground, he loved the teacups and we can't wait till he's old enough to go on more exciting rides. More exciting for mummy, is that Noah finally joined the bugaboo club. I'm in love with it, and regret not getting it from the start. Noah was struggling with sitting upright in his old pram, so after seeing the varied seat positioning with the Bee, I knew it had to be done. Plus it's perfect for holiday in a couple of months. Lastly, around the end of April, Noah became very ill, to the point where he wouldn't take any form of drink or water. We look him to the doctors but were fobbed off, so we took him again and finally got answers - he had a severe bout of tonsillitis. Not good, but after 10 days of antibiotic he's back to his normal and happy self. All in all we've had a good month, we are so happy the weathers getting nicer, and so excited for our holiday in a couple of months. What have you been up to now the weathers nicer?